Tamilnadu Teacher Recruitment Board shortly TRB released the list of application sales centres, application receiving Centres and also Prospectus. Candidates willing to apply for TET, buy the application from the centres on or before the last date. Send the application to the corresponding office on or before the last date. Don’t wait for the last date, apply as soon as possible. This page explains TNTET Application form 2017 for application sales and receiving centres in detail. Teacher Eligibility Test is shortly called as TET is introduced by Government of India to recruit teachers. It is the entrance examination for Teachers. The Exam has been conducting since 2011. The Exam is divided into Paper 1 and Paper 2. Paper 1 exam for class 1 to 5 teachers and paper 2 for class 6 to 8 teachers. The Exam is conducted by both central government and state government in India. Mostly state government conduct the exam by themselves. TRB updated the list of Application sales centres and also receiving centres. You can get application form from the application centre near to you until the last date. Here you can find the list of Application sales Centres and also receiving centres by clicking the below link. TRB updated the detailed information about the Paper-I and also Paper-II. Candidates can download the prospectus for Paper-I and also Paper-II from the below Link. Offline Mode – In any Branch of the Indian Bank otherwise Indian Overseas Bank otherwise Canara Bank using the Prescribed Challan attached with the Prospectus. 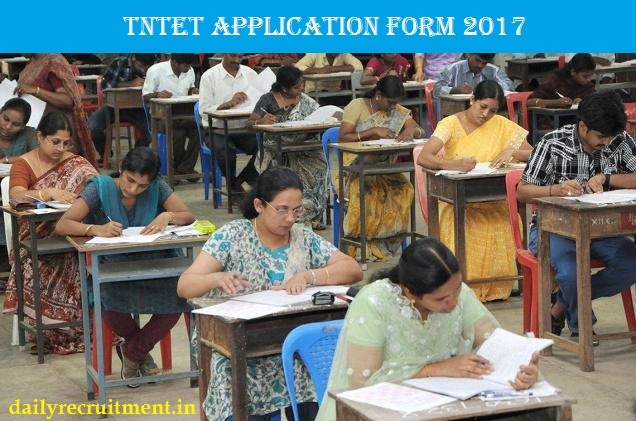 Note: – To find more details about TNTET exam notification 2017, login to dailyrecruitment.in and find information about TNTET in detail.